Molecular characterization based on the internal transcribed spacer 2 (ITS2) sequence identified Micractinium inermum JL1, a local isolate of green alga capable of growing robustly under photoautotrophic, mixotrophic, and heterotrophic culture modes. 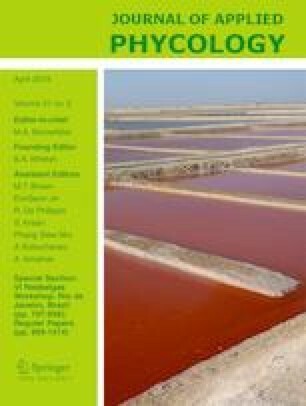 Physiochemical analyses of the alga revealed great variations in growth, lipid content, oleic acid abundance, and productivities of lipids and triacylglycerol (TAG) under various culture conditions including nitrogen concentrations, phosphorus concentrations, light intensities, salinity levels, and glucose concentrations with or without light illumination. The carbon shunt from starch and to a lesser extent from membrane lipids likely contributed to the TAG accumulation. Noteworthily, salt supplementation promoted TAG content and productivity by ~ 88% and ~ 55%, respectively. The alga could accumulate ~ 52% lipids per dry weight and achieved a high lipid productivity of 0.68 g L−1 day−1. C18:1 percentage, a biodiesel quality indicator, reached ~ 50%, and correlated well with TAG contents in a positive manner, demonstrating the feasibility of using C18:1 percentage for TAG quantification thereby avoiding time- and labor-intensive analysis. These results together indicate the potential of M. inermum JL1 as a lipid producer for future exploration. This study was partially funded by grants from the National Youth Thousand Talents Program, Peking University CCUS project supported by BHP Billiton, National Undergraduate Innovation Experiment Project, and Double-First Class Initiative of Peking University.